An electric fan is an electric motor with some fan blades attached to its rotating shaft. 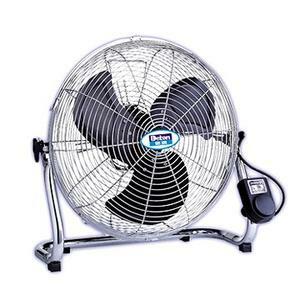 As the motor spins, the fan blades rotate. Each blade is angled a bit, and as the inclined plane of the blade moves through the air, it forces the air ahead of it forward. Each blade does this on a continuous basis, and the result is a moving air stream. The fan is taking air from the area behind itself and blowing it out the front. The fan generates a movement of air, causing the warm, less dense air to rise, and the cool, dense air to descend, thus creating a feeling of coolness in the air. Spring is there and so being the need of the powerful air is needed to keep one comfortable. The cool air can’t be compromised with style. To fulfill ones, need of the fans many companies have come with a wide range of the fans and beautiful designs and colors. Electricplaza is an online electrical shop. This webstore gives comfort of buying at one own ease and also ensures the genuine product purchased with manufacturer’s warranty. This one stop electric shop will provide you with all the variety and choices related to the electrical range.